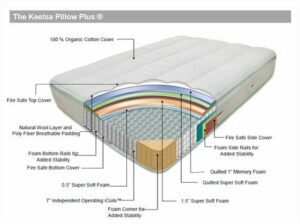 I have had quite a few readers ask me specifically about Keetsa, which is one of the older sellers of mattresses and bedding, but I was unable to respond since I had not actually tried them out. So, I took a trip to New York City to their showroom in Lower Manhattan to try out their models. I spent over an hour in the showroom testing out their 7 mattresses, so I can give you a good overview of what to expect when you buy. Unlike some other predominately online direct-to-consumer brands, Keetsa will charge you a return fee (10% of the price) if you don’t like the mattress, so it is my goal here to make this somewhat less of a “blind” purchase. Keetsa has been selling mattresses for a decade now, so they’re an experienced company in this field. They’re based out of California and have three showrooms there (San Francisco, Berkeley, and Los Angeles), and they also have a showroom in New York City (which is the one I visited), but they do a lot of business online. They ship anywhere in the mainland US and most of Canada. The mattresses come compressed in a box and expand quickly to regular size when opened. They sell seven different models, and I’ll review each of them below. They also sell other accessories such as pillows and mattress toppers. All of their mattresses have a 12 year warranty against manufacturer’s defects and sags 1.5 inches or greater. This is slightly better than the industry “standard” of 10 years. (read more about mattress warranties here). Keetsa has seven models of mattresses. Two of them are all foam, and the other five are a hybrid of foam and coils. The coil mattresses all use the exact same coil system. It’s an individually wrapped coil unit with a very thick gauge of steel (13 gauge, for any other mattress nerds out there). Individually wrapped is one of the better types of coil systems out there, since they’re designed to take the shape of your body and minimize motion transfer. In that way, they somewhat mimic the effect of an all-foam mattress. The foam mattresses are somewhat simpler in construction, but just as good as the coils. They have two collections: The Tea Leaf collection (which are the more expensive ones) and the Keetsa collection (which are a bit less expensive.) I’m not going to review them grouped like that, though. I’m going to review the foam mattresses separately from the coil mattresses, because people are generally looking for one or the other. All of the below mattresses have a 5% off coupon, but the code is specific to the mattress. The corresponding 5% off code is at the end of the review of each mattress. Keetsa has two mattresses that are all foam: the Tea Leaf Supreme and the Keetsa Cloud. 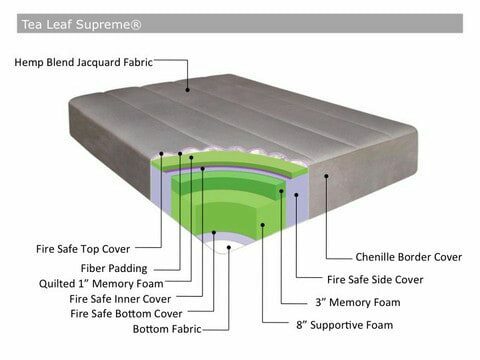 The Tea Leaf Supreme is a medium-firmness foam mattresses. If you’ve ever had the chance to try a Tempurpedic Cloud Supreme, it’s in the same ballpark of firmness. It felt great when I was on my side; I didn’t feel any pressure in my shoulder. It uses 8 inches of a base support foam and 4 inches of memory foam on top of that (which is broken down into two layers: an inch of “quilted” memory foam in the top followed by 3 inches of memory foam underneath). The Tea Leaf Supreme is the more expensive of the two all-foam mattresses, but you’re paying for a higher quality mattress. It ranges from $1164 for the twin size to $1889 for the king size mattress, and you’ll need your own platform foundation. (Note: according to their website, these are NOT adjustable base friendly. Using an adjustable base will void the warranty). The Tea Leaf Supreme is a medium-firm foam mattress. Good for sleeping in any position, but it’s a bit on the expensive side compared to the others. The other all-foam Keetsa bed is the Keetsa Cloud. Don’t let the name “cloud” fool you; this is an extra-firm mattress. It’s one of the firmer all-foam mattresses that I’ve tried. It uses an organic cotton cover, 1 inch of “quilted” memory foam, another 1.5 inches of memory foam, and then the high density support layer. That means you really only have 2.5 inches of the memory foam to sink into before you hit the support layer, but even those first couple of inches is very hard. It’s a 4 pound high density memory foam. I would not recommend this for side sleepers, and if you have a pronounced curve in the lumbar section of your back, you might not be supported on your back either. This is a great option for people that like a very firm mattress similar to a Japanese futon. The price ranges from $839 in a twin to $1322 in a king. (And again, you’ll need your own foundation). If you get this mattress and it’s too firm, a mattress topper might help make it be a lot more comfortable. The Keetsa Cloud is a very firm foam mattress. Good for stomach or back sleepers, and is less expensive than the Supreme. There are five models of Keetsa innerspring mattresses. The models are the Tea Leaf Dream, the Tea Leaf Classic, The Keetsa Latex, the Keetsa Pillow Plus, and the Keetsa Plus. All except the Tea Leaf Dream use exactly the same coil system, and that coil system is very firm. That means even the softest mattress is still very supportive underneath. The Tea Leaf Dream uses a “hybrid core” in which the coils are encased in foam. 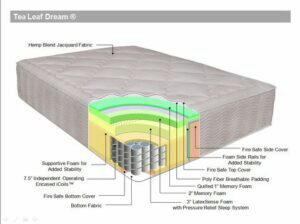 The Tea Leaf Dream was my favorite mattress out of the bunch. I like a mattress just a little on the firm side of medium, and this mattress hits that spot. However, it is the most expensive one, and it does not come in a twin size. (It ranges from $1784 in a full size to $2309 in a king). 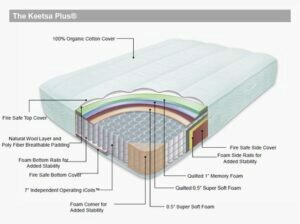 On top of the firm coil system, it uses 3 inches of a firm latex, which gives the mattress a little “bounce” that the foam-only mattresses from Keetsa don’t have. Then, on top of that, there are 3 inches of memory foam, for a total of 6 inches of pressure-relieving material. I like the “gradual” firmness that this one has. It starts off quite soft, and then it gradually gets firmer as you go deeper into the mattress. This allows you to kind of “float” to your correct level of support based on your body’s needs. It’s a real “hybrid” mattress, between a foam and a coil mattress. 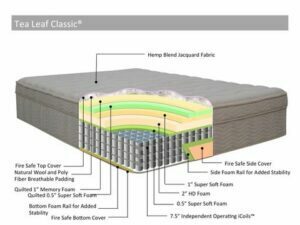 The Tea Leaf Dream is a true “hybrid” mattress. It feels like a bouncier version of a memory foam. This is my favorite in the lineup, but it is more expensive, so there’s a trade-off. The Tea Leaf Classic is another model that uses a lot of foam up top and coils underneath, but the foams in this model are a lot firmer. It’s not an “extra” firm like the Keetsa Cloud mentioned above, but it is pretty firm. If you have broad shoulders and sleep on your side, it might be too hard. Otherwise, for a back or a stomach sleeper, it’s nice. The foams up top are high density foams (and only the top layer is memory foam) so it’ll contour a little, but not that deeply. The Tea Leaf Classic starts at $933 in a twin size and goes up from there, so it’s a little less expensive than the Dream or Supreme models in the Tea Leaf lineup, but it’s still a premium mattress. The Tea Leaf Classic is firm, but does give a little bit (at least in comparison to some of the other models below). It’s another hybrid mattress, but it feels a little more like a coil mattress than the Dream. It’s also a lot less expensive. 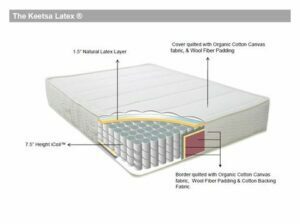 The Keetsa Latex is not an all-latex mattress as the name might imply. It is a coil mattress with a layer of latex in the top. I generally like latex bedding. I’ve had a latex pillow for many years. It’s a very durable foam, and Keetsa uses natural latex. However, this mattress is hard. It is extremely stiff. I mentioned the thick gauge coils earlier, which makes all of the Keetsa coil mattresses pretty firm. On this model, there is just an inch and a half of a very firm latex separating you from that coil system. I would recommend this mattress only if you get a mattress topper to put on top to soften it up a little. The mattress itself is built like a tank and should last quite a while. The warranty is 12 years, and I’d expect it to last at least that long. There’s just no weak spot that should start sagging any time soon. However, the mattress alone is just going to be too rigid for most people. On the other hand, if you grew up in one of the Asian countries in which sleeping on a very hard mattress is common, you’ll feel right at home on this mattress. It starts at $891 in a twin and goes up from there. The Keetsa Latex is one of the hardest beds out there. I’d strongly recommend using a mattress topper with this one, unless you like an extra firm mattress. The Pillow Plus is one of the lower priced Keetsa mattresses, but it’s still reasonably comfortable. I’m told it’s popular for students, kids, etc. For me personally, it’s not the quality I’d like to sleep on every night (then again, my wife thinks this website should be called “The Mattress Snob” based on my tastes in mattresses), but for the price it’s a good value. It’s a medium firmness not too far off from the all-foam Tea Leaf Supreme, but it feels a bit springier (which is sensible, since this is a coil mattress). It uses one inch of memory foam and several layers of what they call “super soft foam.” I’m a little skeptical about the durability of the foam layers in this one in the very long term because of the types of foam on this, but like most things in life, you get what you pay for. The Pillow Plus is only from $576 in a twin to $996 in a king. So, if you need something for temporary use, a dorm room, guest room, etc, this is a comfortable yet affordable option. The Keetsa Pillow Plus is a decent “budget” alternative to the Tea Leaf Dream or the Tea Leaf Supreme. It’s a good cross between quality and price and a medium firm feel. It isn’t too hard, but you won’t sag into it too far either. The Keetsa Plus is their least expensive offering. It’s a more basic mattress and on the firmer side, but actually not quite as hard as the Keetsa Latex. It’s constructed somewhat similarly to the Pillow Plus, just without quite as much padding on the top. So, if you’re in the market for a temporary mattress or a guest room or something, and like a firmer mattress, this is a great option. The price starts at $471 in a twin and goes to $891 in a king. The Plus is the most basic, and least expensive, Keetsa mattress. I actually prefer this to the more expensive Keetsa Latex, but I suspect the Latex will last longer. The Keetsa mattresses tend to skew towards the firmer side of the spectrum. Their firmest mattresses are extra firm, and their softest mattress is what I’d consider “medium.” So if you are buying the mattress without trying them first, keep that in mind. The Keetsa mattresses are fairly high quality, but tend to be a little more expensive than many other direct-to-consumer products. They also don’t have a free return policy, so it’s a little riskier of a purchase. That said, if you’ve tried the product in the store and liked it, you’re likely to be happy with it for a long time to come. Click here to buy a Keetsa. All foam mattresses generally get higher customer satisfaction ratings than innerspring mattresses, so I'd go that direction if you're not sure. Thanks so much for this review -- it is so helpful. I am torn between an Alexander Bed Medium and the Keetsa Tea Leaf Dream. I'd probably go with the latter on intuition alone, but it's almost double the price. I find it so impossible to compare and to know whether it's justified to get it, since I also did like the Alexander a lot as well. And the warranty is better for Alexander. Do you have any thoughts? Hybrid vs. Foam? My main hope is alleviation of neck/shoulder pain -- I have super stiff shoulders/neck, and have always slept on firm mattresses. If you're going into a Keetsa store to try them out, I'd recommend also going into the Nest store. There are Nest stores near all of the Keetsa stores that I'm aware of. (One of the guy who helped set up Keetsa is the guy behind Nest, by the way). Also, consider stopping over at the Nest Bedding store in NYC if you go to Keetsa, just so you can compare. I'm a big fan of the products at Nest. If you're heading to the Keetsa store to try it out, trust your body over anything I can tell you. In generally, having coils is not a good thing in a mattress. It will feel familiar if that's what you've slept on all your life, but foam mattresses get better reviews than innerspring. PS we may go to the NYC store to try Keesta out. We have had a Keetsa PillowPlus since 2011. It wasn't ever terribly comfortable but has degraded significantly during the last year, becoming too firm, while also developing sagging, compressed spots where we sleep. I would not buy another one. We also had a Keetsa Kare Kit which, according to the salesman, was supposed to allow us to replace it with another if we ever wanted. This turned out to be impossible. We sent them photos as they requested and they said that they couldn't see what the problem was. Hi! Thanks so much for your site, it's a great resource for those of us who don't know much about this stuff... I've been sleeping on a Keetsa Tea Leaf Classic for 3+ years, and I think it's great. It's time to get a bigger bed, though... you said in your excellent review that it's a little pricy because of all that "green" nonsense. If I didn't care much about that stuff one way or another, what would be a similar mattress in firmness/quality that might be less expensive? I don't believe any mattress is "toxic." If you can prove that, you can make millions in a lawsuit. That's just not based in reality. Second, I state in my article that it's not organic. I have an entire section on that. Third, they have a return policy in which they take care of the disposal, and you're responsible for the fee less 10% of the purchase price. As Jeff said, Keetsa is selling a toxic, non-organic foam mattress manufactured in China.I had the misfortune of purchasing this horror from a vender who claims to sell organic products in Santa Fe, New Mexico and I have the systemic allergic reactions to prove it.Beware.Now how do I get rid of it?It must be hauled to the dump but even disposal costs money and it is too heavy for me to pick up. I have been sleeping on a Keetsa Plus for 5 years now: the mattress is just as firm as it was when I bought it. I use a lambswool mattress topper which solved the 'sleeps hot' issue. I couldn't be happier with this purchase. They should file a warranty claim in that case. I don't get the impression that the foams are cheap at all, but there are always quality assurance issues with pretty much every mattress being made. While they are Chinese made, I'm inclined to believe them that they didn't just pick the lowest bidder on Alibaba to make their mattresses. I was told they carefully selected the factory, and I haven't seen anything to the contrary. If you look at the reviews for virtually any mattress, you'll hear people complain about the foams falling apart. This is the nature of reviews. Overall, people seem to be relatively happy with their Keetsas. The review aggregation website, Sleep Like The Dead, shows that they have an 83% customer satisfaction rating (though with an admittedly small sample size... there should be about a 4% margin of error). In any case, as I stated in the review, it is my intention to make Keetsa less of a blind purchase by explaining how each mattress feels. I think they're a bit on the expensive side for what you get, but if you really want to buy a Keetsa anyway, I want people to buy the one that best fits their needs. If you look at Keetsa yelp page in San Francisco and Berkeley you'll find many people finding their foams are failing after just 2-3 years. This is the issue with cheap Chinese foam filled with charcoal. Yes, charcoal. Great review, I loved your analogy of the Prius and Tesla S. I'm shopping around for mattresses right now and am considering a keetsa pillow plus because it fits the budget. Would you recommend any other brands similar to Keetsa I can compare with? Here's the thing: I don't really care about any of that. My review is based on the comfort and support of the mattresses. At no point did I claim they were perfectly environmentally friendly. At no point did I say that they were not petroleum-based. In fact, I admitted as much. I am not a part of the hysteria claiming that fire barriers are dangerous. They're not, and they're mandated by law. And saying something is "chemical-based" is just plain dumb, because everything you can touch is a chemical. Water is a chemical. Oxygen is a chemical. Everything is a chemical. Chemical does not mean harmful. Like I said in my article, there will be people who want to buy this mattress because they take some steps to minimize environmental impact (again, not eliminate environmental impact. They're not organic mattresses, and I said as much.) I provided this review as a service for people so they have a better idea of how the mattresses feel before ordering them. And people DO order them. Keetsa is a rather popular brand, despite what you would hope to be true. And outside of a few showrooms in 2 states, people generally don't have a chance to try them, so I tried all of them, so people who order the mattress will know what they're getting. As far as integrity goes, I only sell products that I believe in. It is my honest belief that Keetsa mattresses are well-made, if a bit expensive for what you get. And I also believe that they do take steps to be more eco-friendly than the other Chinese-made products. Again, I'm very up-front in the article that they only replace some of the petroleum with plant-based foams, and as you point out, they replace some of the cover with hemp. At no point have I ever stated differently. If you know of a mattress that fits your litmus test for what "eco-friendly" means and is just as well-made as Keetsa at a lower price, let's hear it. I know of some that are well made and organic, but expensive. I know of some that are organic and cheap, but low quality. I don't know of any that fit all of the criteria that you want them to fit. 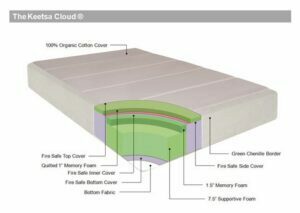 Keetsa is a petroleum based memory foam with a chemical fire barrier mattress made in China and shipped from China. The only thing green is the logo. They use 12% hemp in some covers and say it's a hemp cover. Do you have any integrity or is this strictly a pay to play website? We are looking for a mattress this week and were considering the Keetsa Tea Leaf Supreme. In your review you compared it to the Tempurpedic Cloud Supreme (planning to go test it out). In other reviews I have read that the Tempurpedic sleeps hot and that would be a turn off. We are also considering the Saatva Luxury firm. When we went try out the mattresses in the store, both of us seemed to like the hybrids the best. Do you have any thoughts? We sleep on our side and back. I recently hurt my back (herniated disc) and have been complaining about our mattress being to soft for years, so it is a pretty important purchase. I address the cons in my "conclusion" section. They're a bit more expensive than the "non-green" alternatives, and if you try it and don't like it, they charge you a 25% return fee.